Maybe it's the claims of both states that combine their flavours and make Chandigarh's food such Lip smacking good! Ever visited Chandigarh? If not then you will visit soon. Not for the Rock Garden, Sukhna Lake or Leisure Valley but for its food! Scroll down and take notes, because you are about to plan an unforeseen trip! 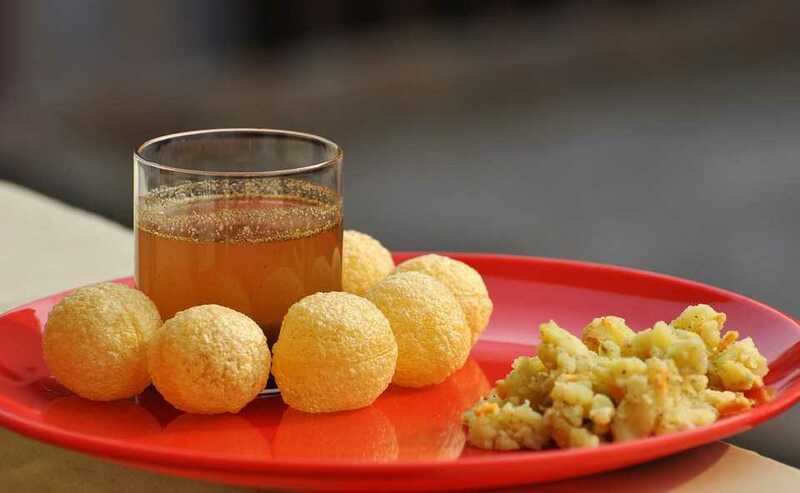 The crunchy crust holding the spicy water or creamy sauce that is the Golgappa that everyone loves! Of course, the criteria of taste is enhanced when you buy the same from Garg Chaat in Chandigarh. If you are visiting here for the first time, it might get a little frustrating to wait for your turn. But as soon as you take your first bite and finish the lot, your desperation for the next line-up will just increase. The menu is part between dry items and others; you will find every known chaat, pakodi, and Gol Gappa here. Note to the reader - Visit this place with an empty stomach. With a little crunchy outside and juicy flesh inside, this Chicken Patty will make you drool! People from faraway places visit specifically to savour the flavour of the Chicken Patty, freshly cooked and packed here at Classic 44, Chandigarh. They have no sitting; you give your order, take your patties and go home enjoy your food with a chilled soft drink. The place has earned its fame not just for the dish but its affordability too; as the starting price for any meal is about 40 bucks! So, do not forget to get your patties packed before visiting the Rock Garden on your next trip to Chandigarh! Rajma is one of the favourite Punjabi dishes. This spicy dark gravy with plain jeera rice will swell your tummy, and you will still crave for more, that's something people say every time they visit Bholey Di Hattey. Along with the lovely Rajma rice, chole rice is also something equivalent. You might get a foodgasm in just a 100 bucks. Totally worth it! Simply Stylish is the word I would pick to describe Brick Firewood Pizza. The place is ranked amongst some best pizza places in town. Perfectly baked crust with hot melted cheese erupting like lava from a volcano, but that's not it. You know what the best part is? All these delighted dishes start from a base price of 100! People of Chandigarh worship the place because it is as crowded as a temple. You will find a rush of new customers becoming regular invitees the next day, try a bite and be one too. Entering the café is like time travelling to the colonial rule; its old English décor truly defines the Indian heritage. The legendary restaurant has a South Indian core and is best in it. They sell all types of South Indian food, Dosa and Wada being their specialities. Other than its food the well-dressed waiters (white and red uniform), Bone china crockery, low prices but quality coffee and milkshakes and tons of room to talk, as they do not ask you to leave when you have finished eating, makes the place ideally social. Earlier, the outlets were poorly managed but this one is an upgrade, and you would love it! Sarson da Saag and Makki di Roti is like a chocolate pudding for a Punjabi, except pudding is no competition! Pal Dhaba is the place serving well mashed Saag and Crisp roti in a perfect blend. Eating here is like climbing a ladder of joy, with each bite you take, you go one step up. The extra butter on your plate defines the Punjabi Pride and your first bite will make you gently shut your eyes in the bliss of flavour. If you are planning a trip to Chandigarh, don't even try to ignore the place, unless you want to repeat the same trips next year! Another son of Punjab, Amritsari Kulcha is the dish with demand as large as the appetite of the entire country. You just can't ignore it. The stuffed Kulcha is served with spicy Chole, with an unforgettable aroma, but what makes the dish worth a dime is its stuffing, mashed potato or cottage cheese is glazed in masala, and cooked after stuffing on a traditional Tawa, makes the true Punjabi happy! Bawa Juice Corner is a decorated outlet with a hypnotic hold over teenagers. Best known for its cohesive combination of lemon soda and cheese patty, the place is your spot in Chandigarh! Summers this season is quite a bummer, well that is a good excuse for making a stop at the juice corner, holding your drink and enjoying a snack. Also, the cheesy corn patty is quite succulent, and the high-quality shakes and other beverages will save your throat from drying out. It is highly recommended to gain refreshment after a day full of pleasure, so turn your car and ask anyone in sector 21, you will have no trouble finding the place. Minds stop when Stomachs growl, every person has experienced it at some point or another. Hunger makes a person irritated, and if someone has to wait more, than a 1 minute is equivalent to an hour, I bet! Whenever this happens, visit Burger Point, the exclusive service technique has managed to gain a good pace in order delivery. You hardly need to wait a minute or so. Also, the reasonable pricing and variety of sauces to pick from brands the burgers as a great appetizer. Almost everyone in Chandigarh is a devotee for the creamy Lassi in the Grand Punjab Restaurant, Mohali. Lassi is prepared with a native hand, and the topping of pomegranate and pista is sprinkled upon it here. The drink is served in a big steel glass, with a spoon to sip the leftover cream at the bottom of it. Just try once, I bet you would be muddled up to choose between your appetite and taste. Now you have one more reason to explore the city than seeing the First Prime Minister's DE arm as Chandigarh. We all have our drunken times; the post drink scenario infuses some heavy hunger in our system. Aroma is the place you want to head then. The place is a bit hasty at the weekends, but it is worth your time. The aroma of cutting chai served with a fluffy omelette is the heart of the place. For our college buds who have less in the wallet and are always high on hunger, some pleasant street food is their shrine for midnight. The Tech Market of Sector 22 is one such place. Ann omelette blended in a parantha is itself an art of this happy man in the Service lane of Sector 16. People are amazed more by the skill of this old man rather than its taste, well the taste is stunning as well. If you wish to have a hearty meal, this is one such place which will never disappoint you. One of the most popular dhabas in Punjab, Khalsa Dhaba offers some delicious North Indian Veg Punjabi dishes. The place has a simple ambience and is most crowded. The food there tastes like home. You cannot miss out the stuffed paranthas, dal makhani, paneer butter masala, chana masala and matka kulfi there. They are known for their quick service. Since it is low on pockets, it is ideal for students as well. Tucked away in Sector 16 is one of the favourite dhabas of Chandigarh, the New Vaishno Dhaba. It is must-visit if you are in the city. Their dal makhani, samosa, kadhai paneer and chana masala are perfect to satisfy your spicy food craving. Their authentic taste of food, prompt service, pocket-friendly prices and quick delivery are the reasons why it holds a good reputation. With a simple ambience, they offer both indoor and outdoor seating. With the evolution of nightlife in Chandigarh, it can be said that the ambience and simplicity of a dhaba is irreplaceable. Hanging out with friends at dhabas has become a significant means of recreation. When in Chandigarh, head to Dil Desi, for their amazing preparation of dal makhani, chana masala, rajma chawal and kadhai paneer. They have an open kitchen, and you can see your food getting prepared. Hospitable staff and hygiene are the key points there. To enjoy home like food at affordable prices, visit Dil Desi today! Katani Dhaba has 12 outlets in Chandigarh and each one of them are highly rated. Suitable for casual dining and home delivery, they offer delicious food in huge portions. Katani is also famous for its sweet items like rasgulla and rasmalai. One can also head there for quick bites, the most popular being bhalla papdi chaat and champ tikka. The dhaba has been there for more than a decade and has been serving delicious North Indian cuisine at economic prices. Explore Punjab, have fun in Haryana, but when it comes to food you have to be in Chandigarh! With so much on your plate, you might add a few more days to your next holiday in Chandigarh.